A 19-year-old Uptown man became that neighborhood's eighth homicide victim of the year late Wednesday. He is Chicago's 200th murder victim of 2015, according to W.H. Thompson at Hey Jackass. The man, identified as Sam L. Johnson, was shot twice in his left side as he stood in an alley behind the 4400 block of N. Malden at 11:48PM. Johnson lived nearby. Witnesses reported seeing a purple van with two occupants flee the scene. The passenger was reported to be the shooter. Police reported "casings all over the alley." Johnson was transported to Illinois Masonic Medical Center, where he was pronounced dead around 12:30 this morning. Last night's killing is the third Uptown homicide since May 29. 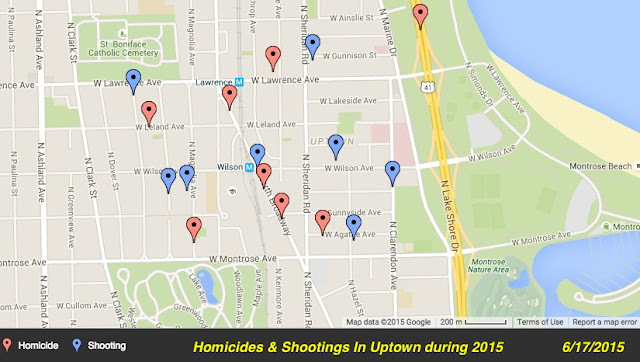 Uptown has not had more than nine murders in any year this millennium. With eight on the books already in 2015, the old record is starting to look like child's play.